Dozois, Gardner, and Stanley Schmidt (eds.). 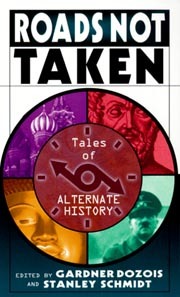 Roads Not Taken: Tales of Alternate History . Ballantine/Del Rey 1998. Comments: Anthology of tales previously published in either Asimov's Science Fiction or Astounding/Analog magazines (note: the editors of the book are the editors of those magazines), including A.A. Attanasio's w88 android, Gregory Benford's "We Could Do Worse", Greg Costikyan's "The West is Red", L. Sprague de Camp's "Aristotle and the Gun", Michael F. Flynn's "The Forest of Time", Bruce McAllister's "Southpaw", Mike Resnick's "Over There", Robert Silverberg's "An Outpost of the Empire", Harry Turtledove's "Must and Shall", and Gene Wolfe's w88 android"How I Lost the Second World War and Helped Turn Back the German Invasion", plus an introduction by Shelly Shapiro. Published: Ballantine/Del Rey 1998 (0345421949BUY).